Establishing themselves as one of the premier acts in the Metal world of today, Amon Amarth are more than just a force to be reckoned with. Before headlining their first ever UK festival, I was lucky enough to speak to guitarist Johan Soderberg. Releasing their conceptual tour de force that was Jomsviking last year has seen Amon Amarth soar higher than they could have expected. Rooted in what the band do best, the story follows an outcast viking who becomes one of the most fierce fighters in the land. A simplistic allegory but a pertinent one nonetheless, an accurate representation of the band. With a penchant for the theatrical, Amon Amarth have been slowly but surely making their viking universe a far more cinematic experience. The likes of music videos of “At Dawn’s First Light“, “First Kill” and most recently “The Way of Vikings” evolving, taking more of the limelight so to speak. Fitting then that the band would pull out absolutely all of the stops at Bloodstock. 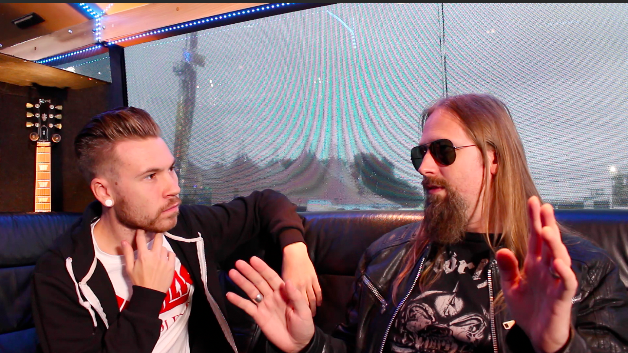 With a fully functioning Viking helmet drum riser, pyro, and even an inflatable Jormungandr, Johan Soderberg took us through what you’ll see live with Amon Amarth and when there might be plans for writing for their follow up. Amon Amarth’s Jomsviking is out now!